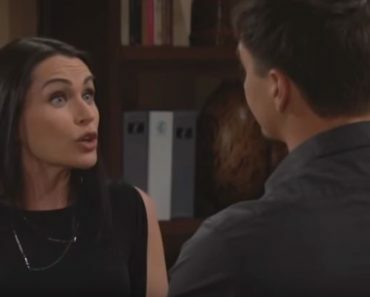 The Bold and the Beautiful fans are not going to go into this week with any more good feelings than they had this week. They have to remember that things were not going well for them last week, and we can recap. For one, Katie and Thorne decided to tie the knot. They made it their mission to get their situation together, and they decided they wanted to be a family before they went into the courthouse to begin the battle to keep her son from his father, or her ex, Bill. They were surrounded by their friends and family in a very quick wedding ceremony that may or may not be something they want to remember for the rest of their lives. The courthouse was a mess. Liam and his father had it out again. He refuses to help his dad get custody of his son. Wyatt, on the other hand, did help his father. He and Brooke both stood beside Bill despite the fact that everyone they love stood on the other side of the room alongside Katie. There was very little that they wanted to do with one another, but everyone is now mad at all of them for supporting Bill. Xander is still trying to figure out his life. Hope and Steffy are mad at one another again. Sally doesn’t care that Hope doesn’t want her in her business or that she’s yet another part of the reason that Steffy and Hope are fighting. All she cares about is the fact that she’s got so much to offer the people she loves. She’s so happy with her life right now, though she doesn’t get why her boyfriend wants to support his father. There’s too much else for her to be so happy about, though, and it was all good. It seems to us like these guys are everywhere all the time. We can’t really say we are mad at it, though. It’s one of those things that just seems to work for some and not for others. There’s a lot, for instance, we just don’t know, and we want to know more. So keep sharing these photos! There is nothing more that we want to see other than who gets to have Will. His mother wants him all to herself, and she will do anything in her power to make that happen. She’s not afraid of what might happen to smear the name of her ex because she wants her son to herself. She’s tired of seeing him upset and sad that his own father always lets him down. She feels he has hurt their son so much that he no longer deserves a chance to even be part of his life. And then there is Bill. He will not lose anything in his life, and that includes his son. Even if it means tearing him from the arms of the mother he loves so much, he will not lose this child. He will do anything and everything he can to make sure that he gets the child all to himself for the sake of winning. While we don’t think this case will turn out at all the way it might seem it will turn out, we will find out this week what happens. Last week brought the closing remarks, and we are excited to see what happens now. Will the judge give the boy to his mother and his brand-new stepfather, or will he give the child to his father who has not been there for him at all? Will he ask the child what he wants in his life or does he assume Will is too young to know?